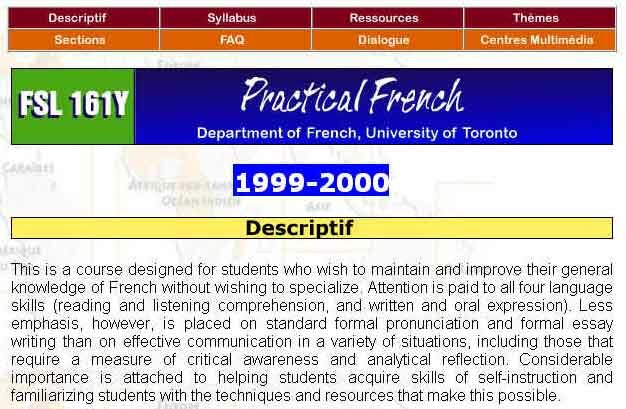 In this course, the acquisition of French is put in the framework of making learning relevant to today's world through exposure to current issues: the student's learning experience is that of a world citizen. The language studied is the real language of the francophone media. Learning modules are thematically organized (the home, nature, the environment, society, shopping, food, travel, health, work, etc. ), with the course manual complemented and expanded by use of World Wide Web sites and documents. The multiplicity of points of view encourages comparison, analysis and criticism. On-line resources include dictionaries and grammars. The discontinuous locus of class hours and multimedia lab sessions is complemented by the permanent locus of the course web site and of consulation and dialogue by e-mail.